The E3 rumour mill has well and truly cranked into action. The very often correct industry insider Dr Serkan Toto has revealed on Twitter that Resident Evil 7 is apparently in development. 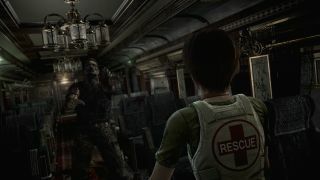 He says "the entire game will go back to RE's horror roots and (essentially) be a clean slate." A return to the proper horror days of yore is definitely what the franchise needs and, given the success of the HD remasters, something that Capcom knows leads to success. But the rumours don't stop there. Toto sounds pretty confident that RE 7 will be shown at E3 and he's even revealed a particularly juicy addition to the dev team. Designer Jordan Amaro previously worked at Kojima Productions on both P.T. and Metal Gear Solid 5. Now this makes things seriously interesting. A P.T dev working on a new Capcom horror? Kojima's lost terrifying playable teaser for the canned Silent Hills had so much potential. PT was, quite frankly, a mini horror masterpiece and if a designer has moved over to Capcom that can only mean good things. He won't be bringing anything with him though as Konami categorically own all the rights to PT and Silent Hills. Combine PT's first person design however, and Capcom's VR horror game Kitchen, and it might not be too much of a leap to imagine that VR could be the next step for Resident Evil. Before you scoff, Sony's big E3 focus this year is clearly virtual reality and we've still not had any big VR compatible reveals from any triple A developers. A sizzle reel from Dark Souls and Bloodborne devs FromSoftware revealed that it's working on a PlayStation VR game but it's never been officially announced. If last year's five minute Kitchen terrorfest was anything to go by - you wouldn't think waking up tied to a virtual chair could be so terrifying - then Capcom has future plans for VR. Linking this into Resident Evil would definitely make sense and can you imagine strapping on a headset to play proper Resi horror? We should definitely take all of this with a pinch of salt as we're still in rumour territory but it sounds like we'll be getting some pleasantly horrific news at E3. With only four weeks to go, expect more leaks to spring prior to the big event.